Which Lane Is Your Business In? I was reading an article this week about the choices that businesses have to make when choosing their customers and modus operandi. You see, you cannot be all things to all people. You are welcome to try, but in so trying, you will only confuse your customers. And in so doing, your customers will become unsure as to what you are trying to do. Are you trying to win them by discounting and cost cutting? Or are you trying to win business by providing a reliable product and a reliable predictable service in an excellent environment? You see, it is impossible to do both. You must choose one lane or the other for your business. If your business chooses to compete on price, then you will need to be cognisant of what everything costs to deliver that good to your customer, so that you can do so and keep doing so at the lowest possible price. On the other hand, if your business chooses to stand out in the market place because of its exceptional service and the World Class Experience that it provides to its customers and clients, then there is significant wiggle room available because in this lane your customers are expecting that their experience will come at a factored in price. And as I’ve said many times, twenty to twenty five percent of the population out there are happy to pay for your goods or for your services without questioning your fee because of the great experience they receive doing business with you. It’s simply a matter of finding those customers. Price conscious customers tend to be more fickle and less loyal. Because of this, the profit per transaction is definitely greater in the Experience lane. So to make the same profit, it is necessary to have significantly more transactions if you are working in the price conscious lane. Which lane would you rather work in? Are You A Master At Providing World Class Customer Service? Last weekend I had the opportunity to act as a tour guide for an overseas guest visiting Sydney for the first time. I love it when a friend travels half way around the world to visit and I have the opportunity of showing off our beautiful city to them, so they can tell their friends back home what a wonderful place we have down here, and how much they have enjoyed my hospitality. Pivotal in any visit to Sydney must be a trip to the Blue Mountains, to enjoy a walk down the main street of Leura and also to see the Three Sisters in Katoomba. And to visit Scenic World Blue Mountains. I must say that every time I visit Scenic World Blue Mountains I am amazed at how well they do their Customer Service. From the moment you check in and purchase your tickets, you know that you are in for a great day. The layout of the property is explained to you by the cashier on a map that you are given, and the key points of interest and how to get around are highlighted for you on the map. The cashier always greets you with one of those smiles and demeanours that make you feel as if they’ve been waiting all day just for you, and that you are the most important person in the world to them. Every, and I mean every attendant in the facility was happy and entertaining as they went about their routines. The attendants on the Scenic Railway were both entertaining and helpful. I just loved the way they made sure to take photos of all the guests [using the guests’ smartphones] with pleasure and excitement and minimal difficulty. I found the drivers very entertaining and informative on both the Scenic Skyway and the Scenic Cableway rides. All in all, the visit to the Scenic World Blue Mountains at Katoomba was a day to remember for my friend visiting from North Carolina. What does this mean and can I apply what I saw to Dentistry? Great customer service is around but it does make itself easily recognisable when it is provided in a professional and consistent manner. Firstly, how are your welcome processes at your Dental Office? Are your patients made to feel as if they are the most important people on Earth when they arrive at your dental office? Or are they greeted with a sign, or an unmanned desk, or by a person looking as though they have better things to do? Are your arriving patients welcomed whole-heartedly when they arrive at your dental practice? Or are they made to feel like a number? Secondly, are the people performing the “everyday” duties within your dental practice going about their way in a manner full of enthusiasm? Are your team members welcoming to your patients, and are your team members making the patients feel at ease, and relaxed? Do your team members exude a confidence and a feeling of personality? Are all of your team members able to greet your clients and patients in such a way that has those valued patients feeling at ease because they are in the right place being looked after by the right people who love doing what they do? These are simple questions you need to ask if you are wanting to make your dental office stand out there in a world of increasing mediocrity. Are you doing everything in your powers to ensure that your dental business does not become “just another dentist” in the long line of average? Whenever I start working with a new client I look at the performance of that dental practice and what they have been achieving prior to engaging my services. The aim of course with the coaching is to then set incremental goals that allows the practice to improve in stages. Small incremental changes that are implemented and adopted result in big changes as time goes by. Large improvements can often be temporary and suffer “rebound”. In the same way that dieters rebound after dieting [they lose the weight and then magically, some or all of that weight that they lost reappears!! ], we want to avoid or eliminate any rebound effects in the business achieved from unsustainable improvements. There really are no overnight solutions. Often, the habits and conditions present that have led to the current situation are so entrenched that correcting them becomes a significant “work in progress”. But with time, small improvements over time will lead to sustainable new behaviours, moving forwards. And that’s what everybody wants to see and hear. Business owners, team leaders and team members all want to know that their improvements and changes in behaviour are leading to beneficial outcomes. But you need to crawl before you can walk. And you must walk before you can run. And you do run slowly before you run fast. I’m always alarmed when I see practice owners who want to up their collections from $600K per year to $1M per year in a short period of time. You see, there is no magic bullet. Improvements are achievable over time, but improvements of that order of magnitude will not magically occur overnight. In most dental practices, the habits that have become ingrained that have lead that practice to its current position are also the habits that require a concentrated attention to break. But break them we must. Or else we do not improve. Last week we began discussing the age-old question as to when is the correct time or correct moment for the dentist to go and do the dental examination in the hygiene room. And a very good question it is. Should the dentist do this examination when it suits the dentist, or should the hygiene room appointment follow a certain set script and time frame? The choice here is one that I hear and see so often. Some practices are adamant that their way is the right way, and even more adamant that any other ways are the wrong ways. Last week we took a good hard look at things from the dentist’s point of view. Today I’ll look at things from the point of view that every hygiene room appointment should indeed follow a certain set script and time frame. The practice, and the team members, must have an inherent desire to run to time, and be efficient at running to time and be efficient at time management. There is absolutely no point in enforcing a structured time dependent system on a practice that has no core belief in efficiency. A practice that does not set daily monetary goals and outcome goals has very little motivation to be adopting a system that will expand the production and collections of the office. And sure, there are practices that still operate an appointment schedule of randomness and who don’t see a need to change it and are still very busy from sunrise to sunset, and booked weeks in advance. All I’ll say here is that I’ve seen one of those practices change, and adopt a structured hygiene appointment system, and change from collecting $60K per month to a whopping $150K per month in a time frame of less than two years.Worth considering? And all they did was take a step backwards, breathe in deeply, and adopt change…. If all of the team members cannot see or fail to see the end purpose of following a certain set script and time frame, then the adoption of a system will present significant challenges. 1. Hygiene is the backbone of the dental practice. 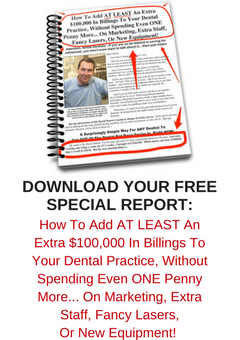 A full hygiene book is the backbone of the dental practice. These are the patients who have committed to regular hygiene maintenance treatments of whatever frequency is necessary, so that they can maintain their teeth for as long as possible. As such, they are patients committed to good health. They are committed to the health of their mouth. They should never be considered as “just a clean” patients, and their visits should never be thought of as being less important in the scheme of things than appointments of a restorative nature. And so, as such, the hygiene visit *demands* structure. It needs to be respected. 2. The workings of the hygiene visit need definite structure. If a patient required more than one hour to have their mouth cleaned by the hygienist then the hygienist had the authority to schedule extra appointments. As such, most patients on regular hygiene maintenance programmes were debrided, and cleaned and examined, and educated, during a sixty minute appointment. And the hygiene component of that appointment needed to be completed by the forty minute mark. This was one of our dental practice non-negotiables. Everything else that we did in our dental schedule revolved around this binding principle that the dentist would be in doing an examination with the hygienist at some point between the forty minute and fifty minute marks of the hygiene appointment. 3. All patients of the practice understand that this is how we do things. For the patient in the dentist’s room having restorative work done, they know, that from time to time, the dentist may need to leave them for a few minutes to go and do a hygiene examination.And they are good with this, because they know, that on other days when they are in hygiene having their maintenance, then the dentist will be called away from another patient to see them. There’s no begrudgement about this. All patients in the dental office know that this is how the dentist is shared around during the day. When the dentist leaves his restorative patient for a few minutes, it is usually at a time in their appointment where they are welcoming of a small time-out, and during his short absence they are always attended to by a dental assistant who engages with them in specific social conversation. 4. It is such a pleasure for the dentist to be examining cleaned mouths. 5. A well-structured hygiene appointment assists the dentist with treatment planning and diagnosis. The hygienist should be able to photograph and show and explain to the patient before and during their cleaning and debridement, any areas of concern that she sees in their mouth, so that the patient is alerted prior to the dentist arriving to do the dental examination.in so sharing these discoveries with the patient, the hygienist may be able to prepare the patient for the most likely treatments necessary, along with any other options that could be possible, before the dentist does their examination. All dental offices that I see operating their hygiene visits using the above mentioned principles are high achieving dental offices. The using of these efficiencies of time management as discussed still allow these offices to provide and to operate with excellent customer service protocols that are outstanding in their delivery. And are so outstanding, that the patients are in awe. And this awesomeness comes about because of the offices regimented maintenance of hidden time deadlines within their hygiene department. It is impossible to build great structure upon weak foundations. How To Succeed In Your Dental Business 101. It’s a fact that people do business with people they like. And if you want to be liked, you need to be interesting. And the best way of being interesting, is to be interested in the person you are talking with. Even if they are your customer. Especially if they are your customer. I recently heard someone question the purpose of acting interested in a person that you are doing business with, suggesting that the act of being friendly and showing an interest in a customer was dishonest in intention. I’m a long term customer of many businesses, and all of those businesses have owners and employees who have learned more about me than simply what I happen to buy from them. If I want bland, I’ll go to the tax office. Or the local council. I’m good friends with my doctor, my hairdresser, my dry-cleaner and the guy at the local chicken shop. Even my postal service owners are friendly and interested.